Basicaly, the TI PPC was the transportable version of the TI PC, with which it was entirely compatible. It was one of the few transportable systems to be available with an optional built-in color monitor, back in 1983. The standard version had a classic 9'' monochrome monitor built-in. Unfortunately the advantages of the PC Portable compared to IBM's offer was not obvious. It was not really compatible (IBM disks could be read, and that was basically all) and IBM expansion cards could not be used. Despite this lack of real compatibility, some software were adapted to the TI Portable PC like for instance, Lotus 1-2-3 or VisiOn. A few programming languages were available: Basic, Pascal, C-Basic, Cobol and RM-Cobol. The graphical possibilities were quite different and significantly better than for the IBM PC, with for example, a maximum resolution is of 720 x 300 pixels. 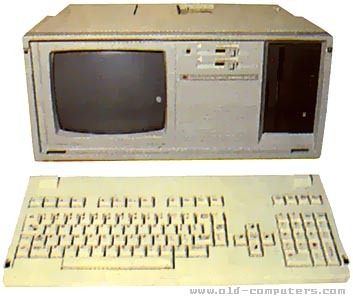 To make a IBM PC graphic program to run on a TI PC you would have to use BIOS or DOS calls. The TI PPC had only 64k RAM that could be expanded up to 768k using quite expensive memory cards. Like its desktop brother, the PC Portable could eventually be equiped with a voice recognition feature (for almost the price of the computer itself !) that allowed to control the basic functions of the computer and some softwares, as a diary and a phone book. With the optional hard-disk installed, it was possible to store up to 8 hours of speech. Another interesting feature was its Ethernet card indoduced in 1983, designed by a young company called 3COM. GRAPHIC MODES 720 x 300 max. OS MS-DOS 2.1 (CP/M 86, UCSD P-system, Prologue and Concurrent CP/M 86 also available). see more Texas Instruments Portable Professional Computer (PPC) Ebay auctions !